Enjoy the convenience of a glass enclosure for your pillars. 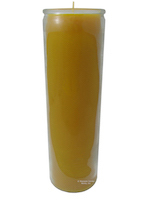 We offer a 16 ounce pillar in glass that will give a continuous burn time of approximately 120 hours. After you have burned your pillar you can clean the glass by placing on a pie tin in a 175*F oven to melt the residual beeswax. We offer 7.5"T x 2"W refills. The refills may be used for hurricane glass enclosures or to refill our 8"T x 2 3/8"W glass jars. Please burn your glass pillar continuously until there is liquid beeswax clear to the edges of the glass before extinguishing the flame. This will help prevent tunneling and burn the majority of the beeswax. 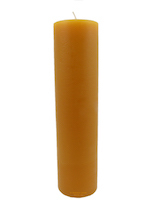 Beeswax shrinks after it has cooled and there is a small space between the jar and the enclosed beeswax pillar. When burning this pillar, liquid beeswax will run down between the pillar and the jar until the space is filled. On our jar pillars, you will notice a layering look. This is because we pour the beeswax at a low temperature and the beeswax “layers” as the wax rises in the glass. Also there may appear a “line crack” at the bottom and at the top of the beeswax. The bottom crack is because we pour a small amount of beeswax in the bottom to “glue” the wick tab on the bottom of the glass. After this beeswax at the bottom has cooled we then fill the jar with liquid beeswax. This will create the “line crack“ at the bottom. The top crack is due to filling in the void that is created after the jar has been filled and the beeswax has cooled. These “line cracks’ are a natural part of the beeswax pouring process and are created when hot beeswax is added to cold beeswax. 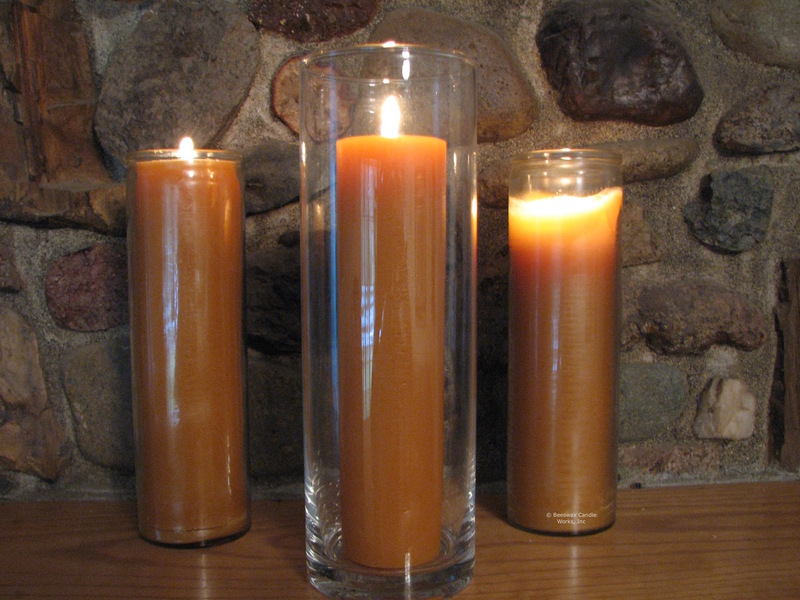 We also offer other container candles in polycarbonate clear cups: 4 oz spa votive candles and tall tealight candles. 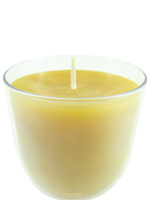 Beeswax is clean burning and virtually smokeless when burned away from drafts. Please enjoy the wonderful lights of our beeswax container candles and remember to never leave a burning candle unattended.